Coconut water is the liquid endosperm obtained from a young coconut (6 – 8 months) which is pure, nutritious and wholesome natural beverage. The sterile water, which is approximately 200 –750 ml, is enclosed with a hard shell and a well-lined layer (8 – 10 mm) of coconut meat. Coconut water is high in ionic nutrients (electrolytes) such as potassium, sodium, calcium, magnesium, chloride, phosphorus and sulphur. It also contains sugar, in the form of glucose and fructose, Vitamin C, Vitamin B group and amino acids such as glutamic acid, arginine, aspartic acid and leucine. 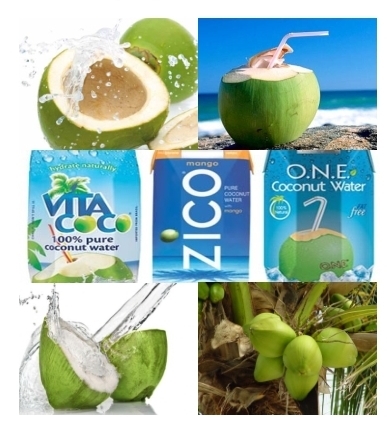 The following are the basic steps in processing coconut water. 1. Select young coconut with no cracks, holes, or other defects. 2. Wash the nuts with tap water and later sanitize with chlorinated water (1 tsp com- mercial chlorine bleach per liter of water). 3. Cut nuts and collect coconut water in clean containers. 4. Scoop meat with spoon and wash with po- table water to remove fibers, testa and other dirt particles. 5. Mix buko meat and coconut water. (optional). 6. Add 20% potable water to the mixture and sweeten with sugar according to taste. 7. Pour in Polyethylene Terephthalate (PET) bottles and seal. 8. Store in coolers or refrigerate. This will last for 14 days or more at 4 oC. Note: Work place and materials to be used should be under hygienic conditions to avoid contamination and exposure to foreign objects. To prolong the shelf-life of coconut water, vari- ous preservation techniques are recommended such as Ultra High Temperature, Cold Preserva- tion and Microfiltration. Ultra High Temperature (UHT) involves heating the water to 130 oC to 150 oC for 2-45 seconds; the product is aseptically packaged in order to obtain a stable shelf -life (1 to 2 years at ambient temperatures); however, the flavour is changed due to high heat; UHT is only used for export purposes.. The maximum capacity for the UHT equipment is 2,500 liters/hour. Microfiltration is a type of physical filtration process where a contaminated fluid is passed through a special pore-sized membrane to separate microorganisms and suspended particles from the liquid; used in ultra filtra- tion and reverse osmosis to provide a prod- uct stream which is free of undesired con- taminants. Cold Preservation is the process that involves filtration, bottling and temperature control allowing the bottled coconut water to stay fresh from 10 days to 3 weeks and retains natural flavour. Coconut water can used as a high-electrolyte beverage with a low glycemic index (54 ± 4) for hydration purposes. (Based on the study conducted by PCA on the Development of a High Electrolyte, Low Glycemic Index Coco Water Drink in 2011). During the World War II, coconut water has been used intravenously since coconut water is identical to the human plasma and can be injected directly into the human bloodstream. Decrease the risk of heart attacks, increase metabolic rate, help in dissolving kidney stones, prevents muscle cramps, and an effective diuretic are some of the health benefits of coconut water.